On January 12th a team of hams, "the Palmyra team", transmitted from Palmyra Atoll, a location ranking in the top ten of the Most Wanted List and #2 in Europe! Palmyra Atoll is is an unoccupied ​equatorial Northern Pacific atoll administered as an unorganized incorporated territory by the United States federal government. In case you are like me, never heard of this place before, Palmyra is located almost due south of the Hawaiian Islands, roughly one-third of the way between Hawaii and American Samoa. ​The atoll consists of an extensive reef, two shallow lagoons, and some 50 sand and reef-rock islets and bars covered with vegetation—mostly coconut trees, Scaevola, and tall Pisonia trees. Operators paradise! 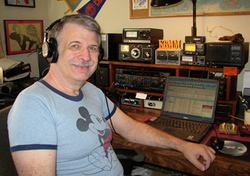 In addition to currently serving as a Director of NCDXF, John is Past-President of the Northern California Contest Club (2008-2009), a founding member of the CW Operators’ Club, and a Director of the Northern California DX Club (NCDXC). John co-chaired the 2011, 2013 & 2015 International DX Convention meetings in Visalia, CA. He is also on the editorial staff of the National Contest Journal reponsible for the NCJ Profiles Column.